The rings are five interlocking rings, colored blue, yellow, black, green and red on a white field, known as the "Olympic rings". 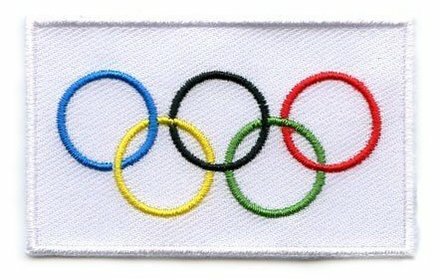 The symbol was originally designed in 1912 by Baron Pierre de Coubertin, co-founder of the modern Olympic Games. He appears to have intended the rings to represent the five participating continents: Africa, Asia, America, Australia and Europe. According to Coubertin, the colors of the rings together with the white of the background included the colors composing every competing nation's flag at the time.